Protests were carried out in Potuvil , Nindavoor, Attalachchena and Kalumaunai with the direction of District Fisheries Solidarity the NAFSO’s partner in Ampara District.In Potuwil this was carried out with 200 people, Nindavoor there were 30 ,Attalachchena 50 and in Kalmunai there were 100.People who were displaced and people of the area participated in this protest. The participation of NAFSO Members and non members was a highlight of this action. 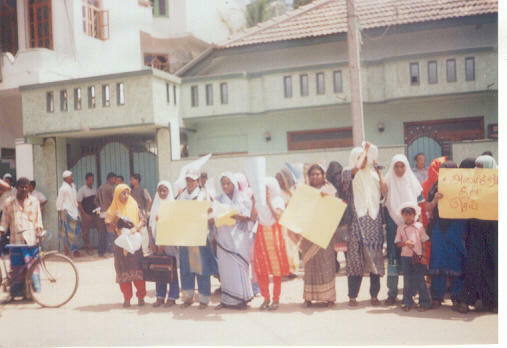 Petitions were submitted to Area Officers at Nindavoor, Potuwil and Kalmunai. 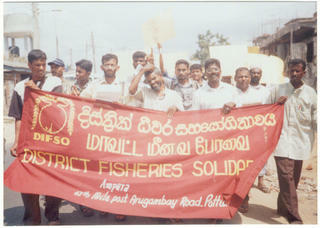 Due to unrest in the area DIFSO was unable to organize a protest in Akkraipattu. The Potuwil District secretary has promised to issue the Rs.5000 subsidy to the affected families.